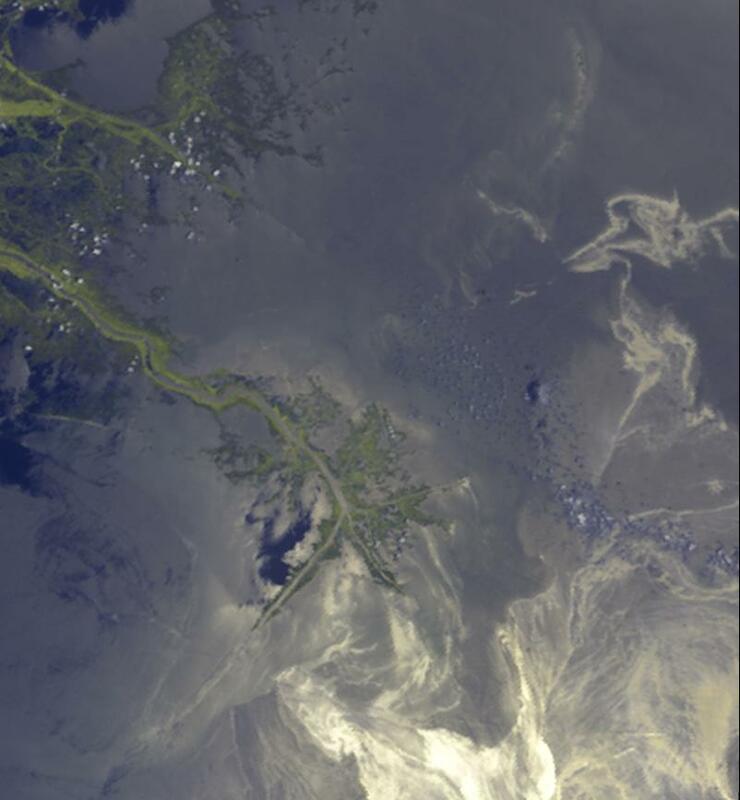 This image, acquired on May 24, 2010 by the Multi-angle Imaging SpectroRadiometer (MISR) instrument aboard NASA's Terra spacecraft, shows oil from the former Deepwater Horizon rig encroaching upon several of Louisiana's wildlife habitats. The source of the spill is located off the southeastern (bottom right) edge of the image. In Figure 1, the left-hand image contains data from the nadir (vertical-viewing) camera, and is shown in near-true color except that data from the near-infrared band, where vegetation appears bright, has been blended with the green band to enhance the appearance of vegetation. 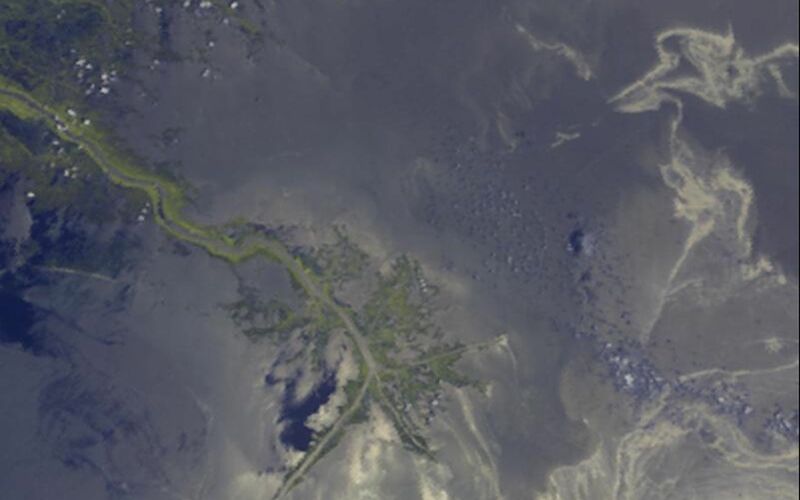 The Mississippi River delta is located below image center. 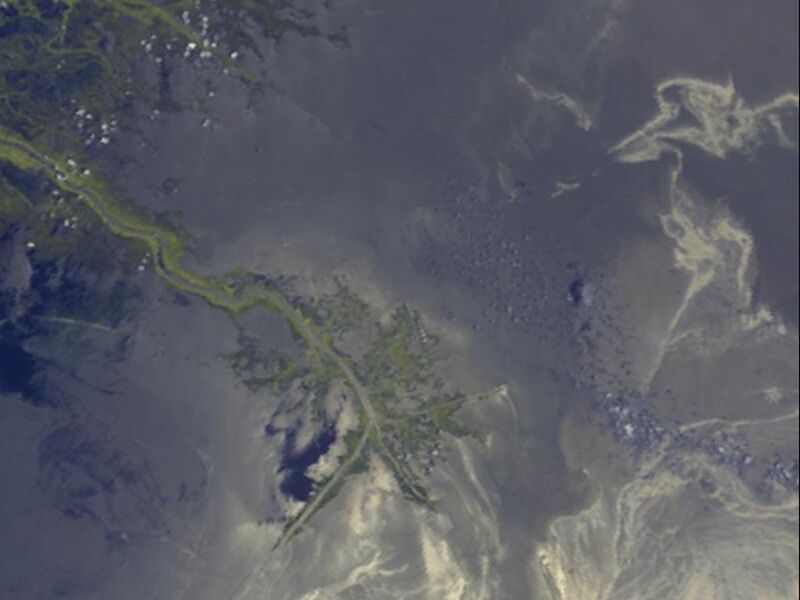 The slick is seen approaching the delta from the lower right, and filaments of oil are also apparent further to the north (towards the top). The oil is made visible by sunglint off the sea surface. Oil is known to have a damping effect on surface waves, making the surface look brighter under these viewing conditions than it would if the oil were not present. However, other factors can also cause enhanced glint, such as reduced surface wind speed. To separate glint patterns due to oil from these other factors, additional information from MISR's cameras is used in the right-hand image. Overflights of the oil from JPL's Airborne Visible/Infrared Imaging Spectrometer (AVIRIS) instrument show the oil to be brighter at longer wavelengths. Glint from clean water is more spectrally neutral. In addition, previous MISR imagery of the spill shows that the contrast of the oil against the surroundings is enhanced by using a combination of nadir and oblique-angle views. The right-hand panel was constructed from a combination of spectral differences and oblique/nadir ratio data from several MISR channels. 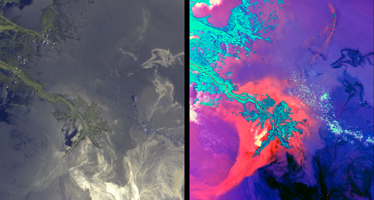 In this false-color view, oil appears in shades of inky blue to black; silt-laden water due to runoff from the Mississippi River shows up as orange, red, and violet; and land and clouds appear in shades of cyan. 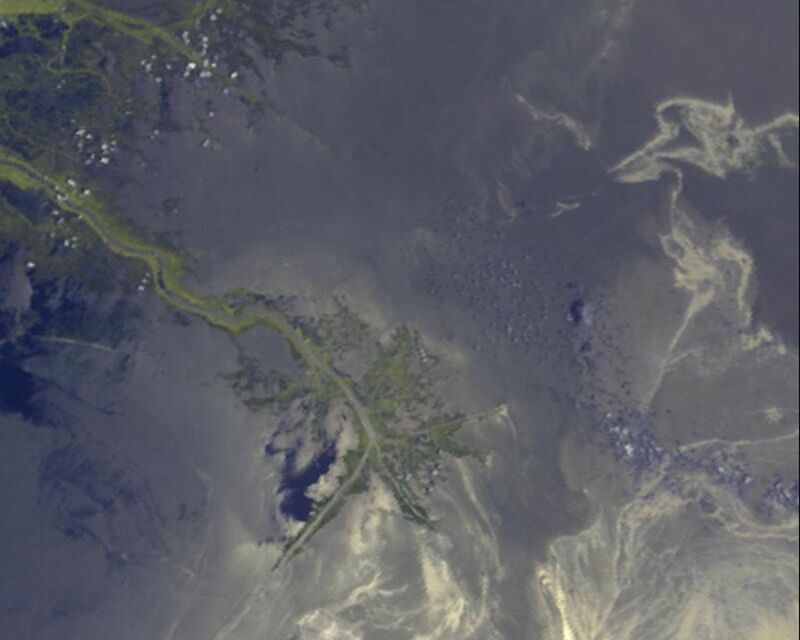 Dark filaments of oil are seen approaching the shores of Blind Bay and Redfish Bay at the eastern edge of the Mississippi River delta, and also nearing Garden Island Bay and East Bay further to the south. These areas are home to many varieties of fish. To the north, the arc-shaped pattern of land and runoff is associated with the Chandeleur Islands, which are part of the Breton National Wildlife Refuge. This refuge is the second oldest in the United States and is a habitat for dozens of species of seabirds, shorebirds and waterfowl. Oil is reported to have reached the islands on May 6. Eighteen days later, this image shows filaments of oil crossing the island barrier -- which had been heavily eroded by Hurricane Katrina in 2005 -- and entering the Breton and Chandeleur Sounds. The images cover an area measuring 110 by 119 kilometers (68 by 74 miles). The MISR overpass occurred around 16:50 UTC (11:50 a.m. CDT). MISR was built and is managed by NASA's Jet Propulsion Laboratory, Pasadena, Calif., for NASA's Science Mission Directorate, Washington, D.C. The Terra spacecraft is managed by NASA's Goddard Space Flight Center, Greenbelt, Md. The MISR data were obtained from the NASA Langley Research Center Atmospheric Science Data Center in Hampton, Va. JPL is a division of the California Institute of Technology.